What are the reasons and causes for bee decline? The reasons are various, and you can read some bee decline statistics here, but there are things you and I can do to help reverse the decline in bee populations. And pease help! Below, you'll find some ideas for actions you can take. I’m sure that like me, you want bee populations to grow and thrive. Together, we can make a difference - so let's just do it! With building development, urbanization and intensive farming practices, we have lost many wildflower meadows and hedgerows. The loss of hedgerows is significant, because they provide foraging opportunities for bees, as well as potential nest sites (for example, crevices and abandoned mouse holes at the base of the hedgerow). 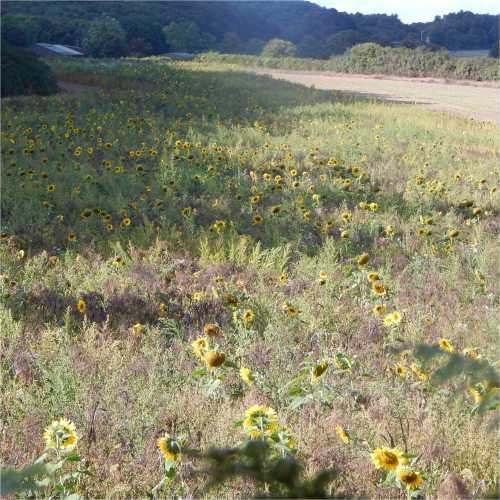 Loss of flower habitat - especially wild flower meadows, fields and verges, is of great concern. An Anglo-Dutch study has found that since the 1980s, we have witnessed a 70% drop in key wildflower species, including plants from the pea, mint, and perennial herb families. According to the United Nations, 20,000 flowering plant species upon which many bee species depend for food are at risk in the future, unless more effort it made to conserve and preserve them. Habitats is important not only for food, but to ensure genetic diversity. If habitat is destroyed, there can be a tendency for patches of appropriate habitat to become fragmented and isolated. Instead of mating occuring between bees of different colonies spread through a range of habitat locations, in-breeding occurs in isolated areas. In bumblebees this causes all kinds of problems, such as the production of males instead of female workers. This kind of problem accelerates decline. When nesting sites are reduced, this obviously increases competition between bees for appropriate and safe places in which they can raise their colonies. Bumblebee queens, for example, have been shown to fight even to the death over nest sites! Delay in finding appropriate spaces to rear a colony, means a later start in the season, which may in itself have its knock on effects. There are some initiatives in various countries and communities to create habitat for bees, and there are things you can do. Ask your council not to mow wildflower verges, and request that your friends and relatives do the same. Councils manage large areas of land and can make a positive contribution. 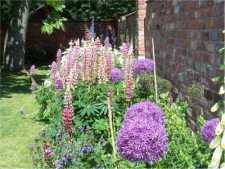 For example, they can manage hedgerows sympathetically, and create pollinator gardens. Public pressure makes a difference. More ideas here. Close up of a pollinator roadside verge near to my home. It may not look very exciting, but it is great for pollinators, as it contains clover, knapweed, rosebay willowherb and more, plus a hedgerow. 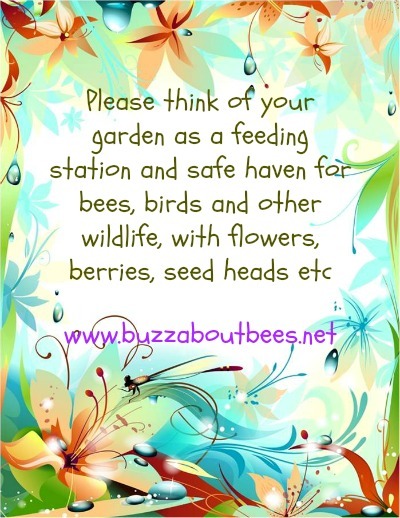 Think of your garden as a feeding station and safe-haven for bees and pollinators! Make your garden bee-friendly, and include wildflowers in your garden. See these tips. 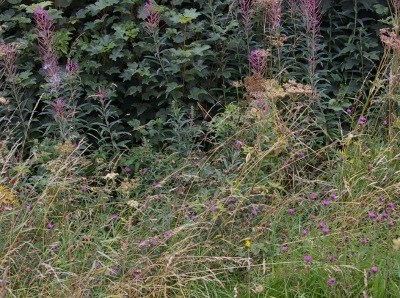 Plant hedgerows – some local wildlife and council groups will even give away native hedgerow species to encourage this. Plant hawthorne, prunus, ribes, honey suckle, berberis, and holly. See more examples. Provide hollow canes for solitary bees and upturned plant pots beneath sheds for bumblebees to consider making a nest in. Don’t use pesticides, including on your lawn, - bees may forage or nest in lawns. See lawns for bees. Inspire the next generation! It's very important children understand the value of bees (and biodiversity, for that matter!). See Inspiring Children. Ask your government, and anyone who can positively influence decision making about farming practice, to support farmers to create space for pollinators, by including a pollinator margin, like this one below. A huge pollinator verge in a field in Norfolk, England. The photograph doesn't do it justice - it was huge! It shouldn’t be a surprise that pollution from pesticides is harmful to bees. 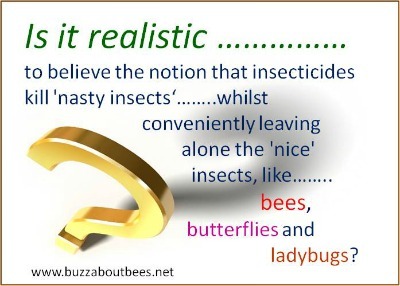 Is it realistic to believe the notion that insectides kill ‘nasty insects’ whilst conveniently leaving alone the ‘nice’ bees, butterflies, hoverflies, lacewings and ladybugs? A quick look at the patents of pesticides can be a real eye-opener – here is an example. 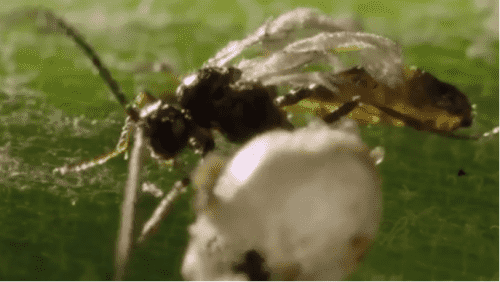 Pesticides can cause acute mortality (i.e. sudden death, occuring very quickly after consuming the poison), or chronic mortality (i.e. 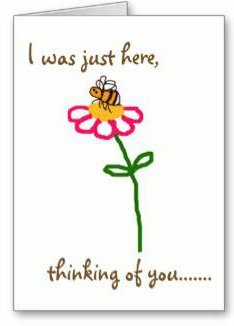 death occurs slowly, perhaps by impairing the the normal functioning of the bee or colony in some way). It has been found that neonicotinoids make insects more susceptible to death through disease and pathogens (more information here and here). There have been attempts to side-step the relevance of pesticides as a causal factor in bee decline. In the environment, it is very difficult if not impossible to pinpoint one particular pesticide as a causal factor in bee deaths. Nevertheless, some field trials and experiences of many beekeepers point to neonicotinoids as a causal factor at least in some cases. However, this misses the point to a certain extent. The regulatory systems for pesticides globally, have been found to be woefully inadequate, and this needs to be addressed. See this EU report, and examples from the USA and Australia. Personally, I have come to the conclusion that the regulatory system is more about ensuring no negative effects are reported, rather than protecting bees and the environment by testing properly. If industry is not challenged by the regulatory system, they (and farming) will not be motivated to find better solutions. Farmers, in my view, are falsely reassured and misled by the regulatory system. 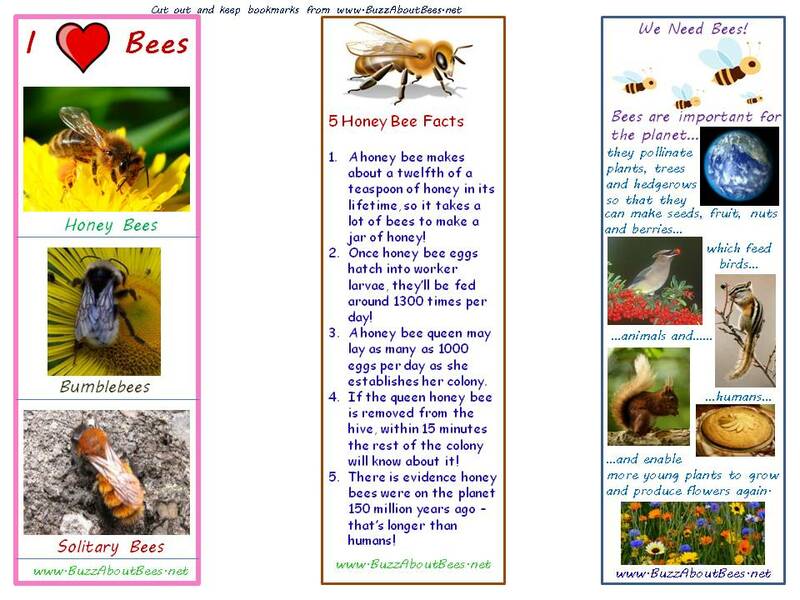 Please see this page about myths and flawed arguments used to defend neonicotinoids. We need to change our attitudes toward insect species, and realise that most are beneficial or harmless. It seems we put much at risk for the sake of a few ‘pests’ – the role and habits of which we may not fully understand, and in many cases, environmentally friendly alternatives are available. Please help raise awareness that most insects species are beneficial or harmless – share this page. Get involved! Campaign for changes to the system and bans of harmful pesticides, by signing petitions, sharing with friends, writing to politicians and so on. Bee decline does not only apply to honey bees, but wild bees and other insect pollinators (and many invertebrate species generally). The finger is often pointed to Varroa as the single cause, but Varroa mite only affects honey bees, not other bee species. Cutting out pesticide use could play an important role in stemming disease and pathogens in bees, but there are other issues, such as spread of disease from commercially reared species to wild bees. See this report (opens a new window). Please think twice before purchasing boxes of bumblebees for your garden (in some countries, they can be bought by gardeners). Rather than helping the bees, they may cause harm. extremes in weather conditions, from flooding to prolonged winters (all bad news for bees as for other wildlife) and impact on plant life. A difficult one, other than being considerate in using the Earth’s resources as best you can! However, with regard to gardening, there are some things you can do to provide for bees in difficult conditions (within reason!). For example, if you live in a drought area, take this into account in your choice of plants, and provide shallow water and damp mud for bees. 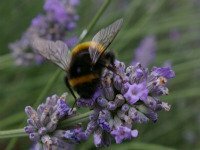 See this post about gardening for bees in challenging conditions. Although bee decline is a worrying issue, nevertheless, there is much we can do - many simple actions we ourselves can take. As some-one who has campaigned and experimented with different ways to help bees, I have been encouraged to see more species of bees in my garden this year than in previous years, including 2 uncommon species of bumblebee. There is far greater buzz about bees than ever before, and increasing awareness of our need to change and try to garden in ways that assist and enhance biodiversity. 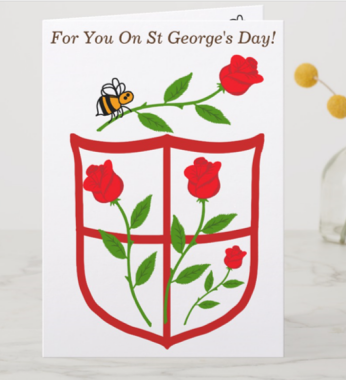 Gardeners are deliberately choosing plants to help bees and other pollinators, and so together, we are creating feeding stations and bee-sanctuaries across the countries in which we live! That's good news for bees, biodiversity and people alike!